The photos of famous artist studios are empty, ghostly artifacts of life – paint drippings on the side of the table, brushes encased in dried paint, some paintings in disarray, some stacked neatly against the wall. The artist is invisible, her presence perceptible yet she is not there. Only her art and the space created are portrayed. It’s as if there must be proof that the art was made in a room, in a legitimate space, for it to exist. The artist studio is iconic, recognizable in any image, with or without the artist. The hand of the artist becomes arbitrary, as if her art cannot become without a studio. If exhibited in the studio space, she is often posed, standing in the space, yet occupying very little of it – dwarfed by the size and gravity and magnitude of her studio. She is the artist inaction, her studio the source of her creativity, or that is what is told through these representations. Specific motifs, tropes and symbols pepper each studio, indicators of what we perceive to be an artist’s studio, regardless of specific location or type. While a photograph remains impartial to truth or non-truth, it is the evidence garnered from the image that builds discourse.1 In this essay I am using the photograph of the studio to construct a discourse from an impartial image. It is not my intention to delve into the photographer’s mind – it is not the act of creation but the focus of the eye. Rather, I will facilitate a dialectic of photographic theory to dissect the image of the artist’s studio, and how it has swiftly become analogous to the artist herself. The obsession with the artist personae during a time of advanced technological change2 has been transposed to the image of her studio, which in turn replaces the need for the depiction of the artist. Paintings of artists in their studio is a common theme through history and for varying reasons. In “Gods Little Artist,” Parker and Pollock briefly survey the representation of artists, and the ideology of these representations. In the 16th Century, the artist was represented by social class, in the 17th Century by academics – such as Vermeer’s The Allegory of Painting — and the 18th century by literature (83).4 Each depiction heightened the mythos of the artist and the studio. 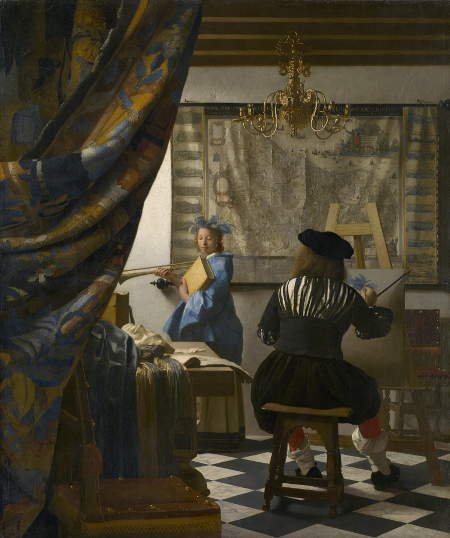 In Vermeer’s The Allegory of Painting (Artist in his Studio), the drawn back curtain allows us, the viewer, to peek inside an intimate moment between artist and subject, and in a space that few eyes see. Though succinct in its verisimilitude, this and other paintings of the artist’s studio are false representations. The allegoric encompasses both reality and illusion – the paint on the canvas can never fully represent life, as it stands at constant risk of being manipulated by the artist. It is when the camera emerges in the 20th-century that images of the artist in her studio transform from allegorical to representative. The rest of my essay will focus on this non-allegorical perspective of the studio, exploring the indexical relationship between image and perception of both artist and studio, and how the myth of the artist becomes absorbed into the representation of the studio space. The introduction of the camera and photography introduced both a new way of seeing and a new way of thinking about representation. The major texts I will focus on in this section is the “Theory of Signs” by Charles Sanders Peirce5 and Camera Lucida by Roland Barthes, as well as “Index and the Interface” by Kris Paulsen. By building a dialogue with these analysis I will explore the theoretical mainframe of the photographic image, specifically in regards to the artist’s studio, and begin a discussion on how this plays with the representations and obsession with the artist personae. Most visibly, the sign indicates an object. 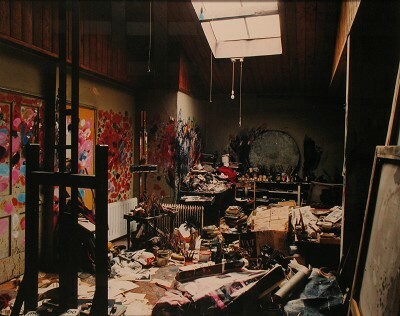 In regards to images of the artist studio, the photo of the studio by itself is the sign of the object – the artist. Though the object — i.e. the artist — is not physically depicted in the photo, there is still a trace of her presence. Of the three parts to Peirce’s definition of signs, it is the third part, the interpretant, which has a more abstract meaning. Peirce describes the interpretant as our understanding of the relationship of the sign and object, which therefore makes “the interpretant central to the content of the sign, in that, the meaning of a sign is manifest in the interpretation that it generates in sign users.”7 The interpretant8 is crucial to our understanding of the relationship between the artist and the studio. I argue that in the case of the representation of the artist studio, the interpretant is the viewer’s obsession with the myth of the artist – the studio stands alone as a sign for the artist because of this fascination with the artist personae. As mentioned previously, when looking at images of the studio the trace of the artist is always present , regardless of physical presence. The trace of the artist is what Kris Paulsen calls the index – the sign of presence. Paulsen relies heavily on Peirce’s writings, contextualizing his semiotics to our analog and digital age in her essay “Index and the Interface.” She calls the photograph simultaneously icon and index,10 both representation and trace. The image of the studio then has an indexical relationship to the artist – in each image of the studio, there are small traces of the artist. 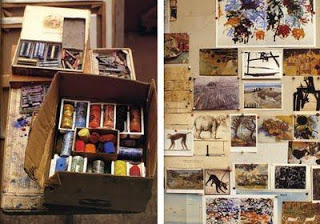 One of the clearest examples are images of Joan Mitchell’s studio, catalogued in the book Artists at Work. Easels and canvases stacked against the wall, paintbrushes, a palette, tubes of oil paint rolled tightly to squeeze the last remaining pigment out. The most poignant image for me was the picture of postcards hung on her wall – images of great artworks, art from friends, images cut from National Geographic. These are small indicators of what inspires her. Each marker is an icon of the artist, a representation that she has been there, has occupied that space. The images in Mitchell’s chapter in Artists at Work all contain traces of her, whether or not she is physically present. She is the object, the referent, which all other aspects in the composition of the photo point to. Though it contains the icons of the referent, the index itself is not the material aspects, however closely tied to them. Nor does it “necessarily serve as a record of the past or testify to clear evidentiary truth…the index emerges as a particularly helpful category for understanding mediated information.”12 The mediated information here is how the icon indicates the referent – the artist – through the space and sign – the studio. As I have explained above, the artist and the studio operate together – for the index to exist, there must be a referent.15 However, in the next section, I will explore the ideological separation of the index and referent, examining how the myth of the artist has been transposed to the artist studio. Though the referent is still present, the obsession with the artist has shifted from the object to the sign, creating a strange dichotomy in the relationship between the artist, studio, and the viewer. The fixation on her personae has led the Artist to become a presence, someone who operates differently from the general public. With the cult of personality, the enigmatic artist creates what Walter Benjamin calls the aura. The aura is defined by the distance between viewer and object – if the object is untouchable, we want to get even closer to it, to bridge that gap. This distance creates a seduction around the object, the artist. Because the artist is untouchable, she becomes mythic. Thus, an obsession with her life – her biography, her creative process, the interactions she has with her own art — each little detail the viewer discovers brings us closer to the artist, shrinking the distance between us and her. The most accessible place for us to get closer to the artist is the physical place in which she creates – her studio. We seek to become inspired by the artist’s space, as if by walking through her studio we will suddenly be struck with inspiration. Or perhaps by gazing at the studio we will start to make sense of the artist’s personae, fitting the icons into our own pre-conceived notions. This is a phenomenon that began with the photographic depictions of the artist’s studio. Photographic reproduction eliminates the aura, masking the detail and visceral qualities present in reality. The onset of new technology demanded new ways of seeing. For Benjamin, the aura created by the artist is dissolved with the photograph, the unique space inhabited by the artist becoming a reproducible copy. Yet, the mystique of the artist does not fade — in these representations of the studio, the aura of the artist has shifted from object to sign. In Studio and Cube, Brian O’Doherty outlines this shift, describing a trio of forces that define the studio. Here, I discuss two, and the third I will elaborate on in the next section. With the focus on the act of creation, the relevance of the actual product become an after-thought, a claim which I will dissect more in the last section of my essay. His second part in the definition is the “transference of mystique from artist to studio.”19 While there is always a trace of the artist present, the studio now commands its own aura, perpetuating distance between the viewer and the studio, and again the viewer and the artist. The most salient example of this distance is in the Hugh Lane Gallery’s exhibit of Francis Bacon’s studio. 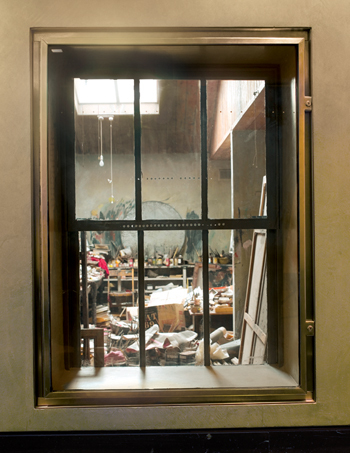 In 1998, Hugh Lane Gallery began the process of removing and relocating Francis Bacon’s London studio to Dublin – dust, ceiling, wall, and all – and had everything inventoried. What makes the Francis Bacon Studio so interesting is not only the intensive cataloging, but also that it was done a few years after his death. The Hugh Lane gallery memorialized Francis Bacon the artist, not his art. Since the artist is not present to represent himself, the studio does it for him. This is a clear indication of the studio as a sign-vehicle for the artist. It transmits the aura of the artist, becoming a prime example of the messy, destructive, and creative image held in the general populous’ mind. When we view the studio in this way we forget the hand and see the space. What this exhibition becomes is a commodity and an embodiment of the transmission of the artist’s aura to the studio. The plexi-glass barriers create a space between the viewer and the artist and giving us a peek into an entirely inaccessible place. Yet, because of the seduction that Francis Bacon’s studio commands, the viewer is still drawn to it, window-shopping for creative inspiration. This and other representations of the studio are treacherous in their appeal, idealizing the studio into a mecca of artistic abandon that one can only hope to touch. The image of the studio becomes the punctum – the venerated image we create. What becomes lost in these representations is the actual function of the studio – a place where the artist creates. In the next section, I will discuss the function of the studio versus the image of the studio that is created, and what this means to the relationship between the artist and the viewer. In Daniel Buren’s essay, “The Function of the Studio,” he critiques the veneration of the artist’s studio, fighting against the seduction it holds and instead argues that the focus should be on the work of art, not the space it was created in. The function of the studio is a place for the artist to create, and for what he creates to be assessed, critiqued, and sent to a gallery or museum. Images of the studio tell us otherwise, that the artist is absent, invisible to our eye and only traceable through the signs peppered throughout the space. What happens to the Francis Bacon’s studio, and many other studios that are on display, is that they become “boutique where we find ready-to-wear art,”22 which perpetuates the idea that the viewer in the studio is window shopping for creativity. The studio, Buren argues, is a place for the artwork to connect to its own reality separate from the white walls of the gallery or museum, and free of financial and cultural gains. If the work is to be outside the studio, then it is compromised, alienated from its original place of conception. Yet, if it remains in the studio, it is never seen, and the aura of the artist disappears. As mentioned in the previous section, O’Doherty’s defines the studio as a place for the myth of the artist to flourish. Here, the third part of his definition of studio concerns itself with the physical space itself. He say that the studio promotes a “reductive studio povera, which contribute to the clean, well-lighted place where art is shown.”24 In effect, O’Doherty is comparing the studio with the gallery, a venerated place for art to be shown in the white cube. By emulating the gallery space or the boutique, the artist’s work becomes a commodity rather displayed as something of cultural significance. While Buren proposes that we switch to art outside the studio (post-studio art) to focus more on the work than the myth of the artist and her studio, I argue that the studio still holds important indexical information in understanding the work of art. It is not necessarily a means to understand the artist’s biography, but mostly to give contextual evidence in the meaning behind the work. 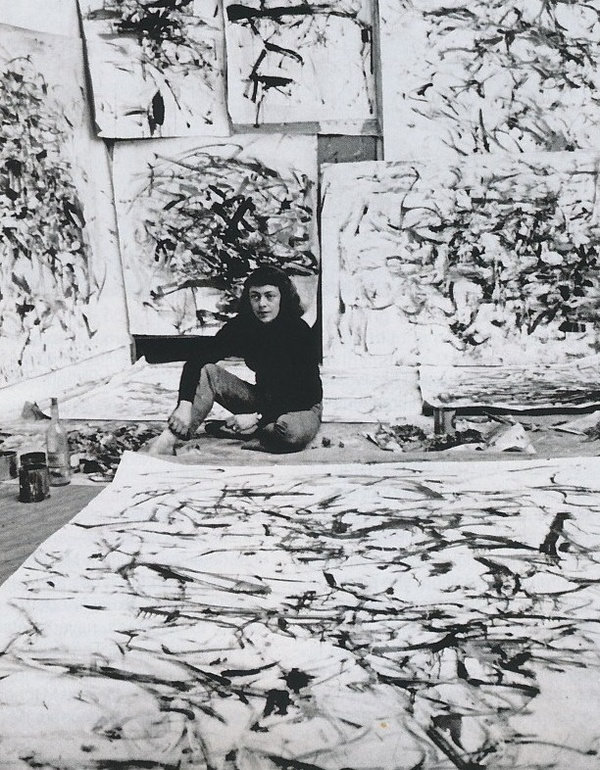 Instead of producing images of the artist studio without the artist, I claim that the representation of the artist in her studio — not standing in front of a canvas, dwarfed by her own creation (like Joan Mitchell in her studio) — but fully in the act of creating, will transfer the aura from the sign back to the object. The artist will no longer be a trace in depictions of the studio but engaged with her own representation. In doing so, the mythology of the artist will still be prevalent yet she and her work become more accessible as she emerges from behind the icons that stood for her, thus enabling her work to have life inside the studio and in the gallery. The photograph of the studio as a document to the creative process is crucial to understanding the changing role and defining characteristics of the artist. As representations of the artist evolve, so will the depictions of her studio. It is crucial to note that the artist must always remain the object in representations – if not, the cultural value of her art turns from one of artistic significance to mainstream commodity. While the image is impartial, the reading of them contends with the meaning of the artist and studio – without the artist, the referent, there is not studio, the sign. When the artist is physically absent from the image of her studio, she still leaves a trace. It is important to dissect the semiological aspects of representations of the artist’s studio. With photography, few things are hidden from view, as the photograph is impartial. It simply shows what the operator of the camera sees through a pinpoint. It is our role as the viewer to engage with the semiotics of photo, employing and understanding the theoretical language of the image as well as challenging it, to eliminate the cultural commodification of art, and to redefine the aura of the artist. Atkin, Albert. The Stanford Encyclopedia of Philosophy. “Peirce’s Theory of Signs.” Edward N. Zalta (ed. ), 2010. <http://plato.stanford.edu/archives/sum2013/entries/peirce-semiotics/>. Barthes, Roland. Camera Lucida: reflections on photography. New York: Hill and Wang. 1981. Benjamin, Walter, Hannah Arendt, and Harry Zohn. “The Work of Art in the age of Mechanical Reproduction,” Illuminations. New York: Harcourt, Brace & World, 1968. 217-253. Gunning, Tom. ‘‘What’s the Point of an Index? Or Faking Photographs,” Still Moving: Between Cinema and Photography, ed. Karen Beckman and Jean Ma. Durham: Duke University Press, 2008. 23-41. Jacob, Mary Jane, and Michelle Grabner. The studio reader on the space of artists. Chicago: School of the Art Institute of Chicago. 2010. O’Doherty, Brian. 2007. Studio and cube: on the relationship between where art is made and where art is displayed. New York: Temple Hoyne Buell Center for the Study of American Architecture. Seidner, David, and Diana Edkins. Artists at work: inside the studios of today’s most celebrated artists. New York: Rizzoli. 1999. Bethany Cluff is a multi-disciplinary artist, writer, and teacher based in Columbus, OH. She is critically engaged with the expression and advancement of children through the arts, and is currently working on a project that focus on emotional limits and the female body. Bethany is a graduate of The Ohio State University with a B.A. in History of Art. THAT: A conversation on art that isn't art (but maybe really is) and on non-art that is art (but maybe shouldn't be) What the hell does it mean to consider something *as* art vs. as *art*? And should anyone even care?